Performance takes into account Speed Loss (includes factors that cause the process to run at less than maximum possible speed) Examples include machine wear, substandard materials, mis-feeds, and operator inefficiency. We started this project by using the Six Sigma methodology DMAIC: 1) Define; 2) Measure; 3) Analyze; 4) Improve; and 5) Control. 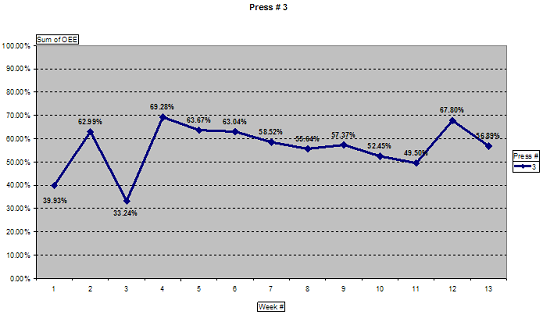 The measure phase began with adapting the Daily Production Log (DPL) to accommodate the data needed to track the OEE. This form is used by each operator on every piece of equipment to track all hours, down time and production. In the control phase data is continuously monitored to ensure that all control parameters are within desired ranges.